We are major Manufacturers, importer and exporters of the Ladies Stylish Kurtis. These Kurtis manufactured using high grade and fine quality fabric, the range is tested on various quality parameters.The range of products are Designer Kurti, Ladies Intricate Kurti, Designer Neck Kurti and Ladies Exclusive Designer Party Wear Kurti. 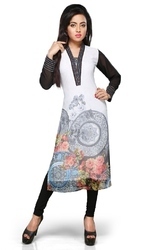 This tunic style kurtis comes in various sizes with long length. Trendy Stylish Long Pakistani Style Kurti can be club with leggings or it can go without them on party & outing. We are a distinguished manufacturer, wholesaler and trader of a wide assortment of Ladies Garments. our products are a perfect blend of contemporary fashion and traditional designs. Our designs are best in market and as well as rates also. Please contact us for latest collection of Woman's Wear. Indo Western Designer Tunics. Our fine and delicate weaved fabrics are tested for the tear strength and shrink Resistance before being designed to perfection. The sophisticated warehousing are necessary for longterm storage and safe delivery to the clients. We offer varied payment mechanism and shipments to reduce cost of final good.